I might have lost a few of you when I titled this The Famous Chocolate Wafer Icebox Cake, however I am sure that once you saw the photo, 99% of you knew exactly what this recipe is. 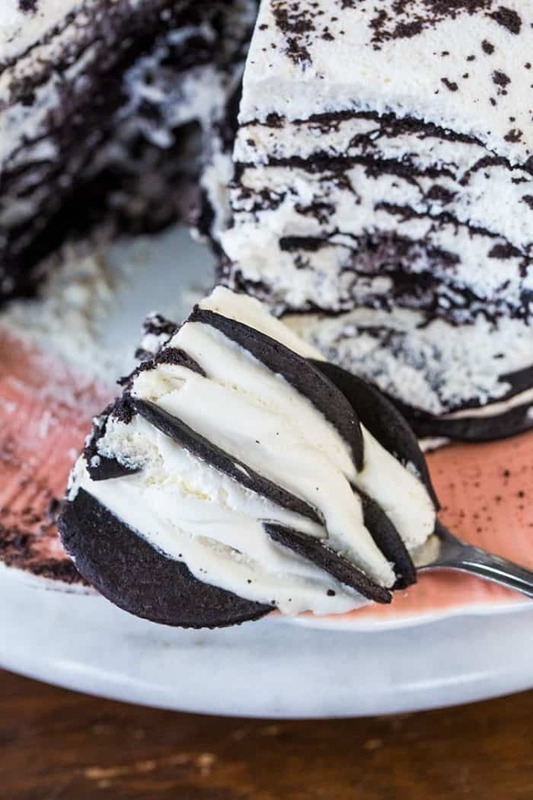 This icebox cake is that famous whipped cream and Nabisco Famous chocolate wafer cookie roll, log or cake that ALL of our moms and Grandma’s made. Everyone has their own name for this cake. We called it the whipped cream log. Mike’s family called it a Yule Log and only ate it at Christmas. plate. This will hold the bottom cookies in place. Top with whipped cream. Repeat for another 10-11 layers. Finish with whipped cream on top, then sprinkle with leftover broken cookies. Wrap lightly with plastic wrap and refrigerate overnight until the next evening. Remove and slice carefully to serve! No matter the name, everyone LOVES this cake. It’s one of my fondest childhood food memories. My mom would make this in a log shape – and usually cobble together two boxes- and we would impatiently wait until the next day. You simply must leave it in the fridge overnight for the best results. The secret is the length of time you let it sit in the fridge. This whipped cream and chocolate wafer cake WILL slice beautifully if you let it sit overnight until the next evening. The cookies and the whipped cream soften up together and form a cohesive cake. Now I know that a lot of people use Cool Whip in this – and the taste is completely different. It’s still good – and to be honest, way less fat and calories if you use the Light Cool Whip and if you want to, go right ahead. It’s your cake! 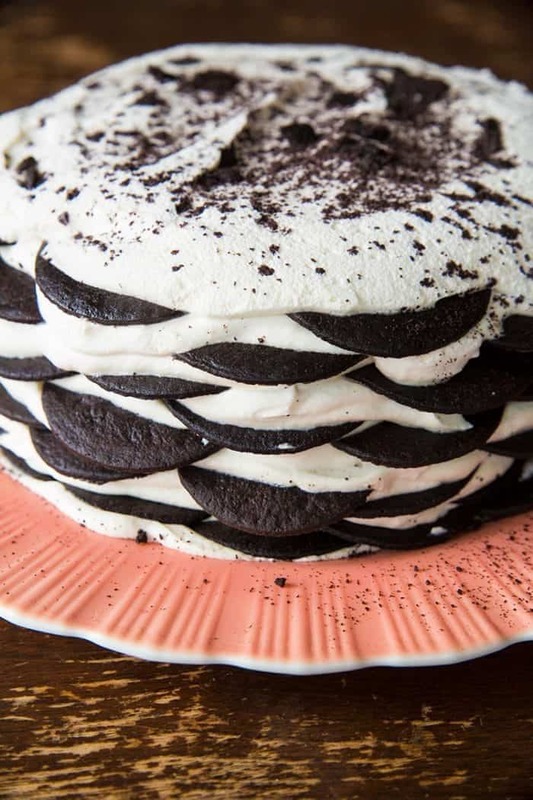 Now apparently Magnolia bakery in New York popularized the round version of The Famous Chocolate Wafer Icebox Cake around 5 or 6 years ago, but it’s the same cake that our Grandma’s have been making all these years. People were paying a hefty price for it as well! You can make this refrigerator cake in tiny stacks in trifle cups. You can make it in freestanding stacks. You can make this in a big round cake like I did. You can make logs that are straight and logs that are in an “s” shape like my Mom did. 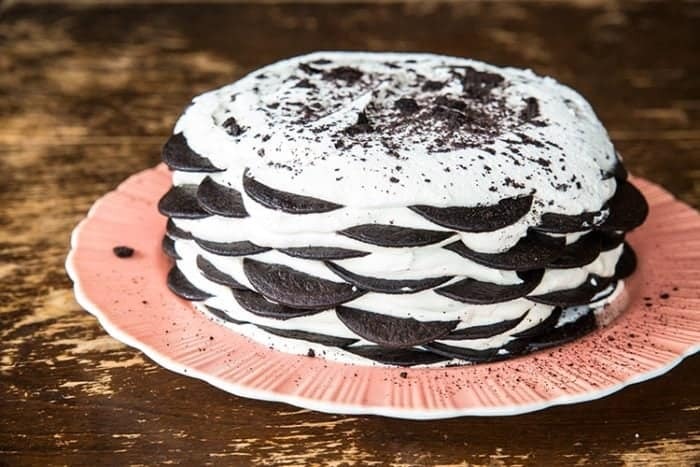 Babes, it’s STILL the original Nabisco The Famous Chocolate Wafer Icebox Cake, no matter how you stack it! Pin This Recipe to Your Dessert Board & Remember to Follow Me On Pinterest! 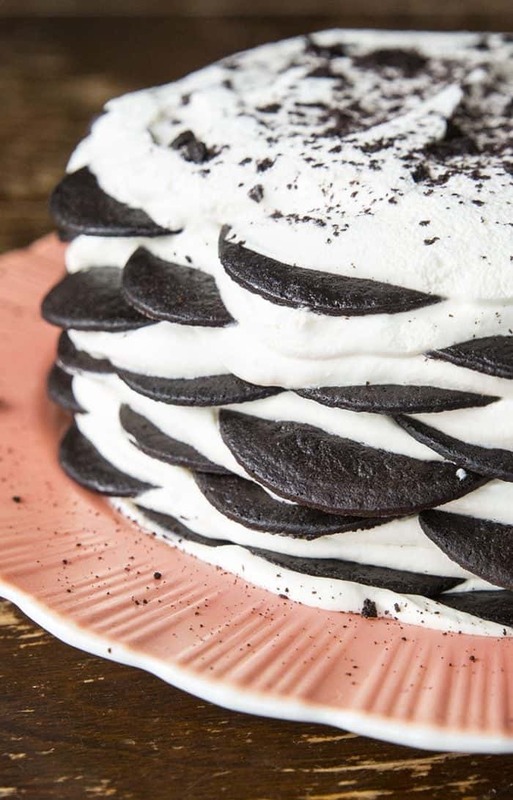 This chocolate wafer and whipped cream icebox cake is a classic from everyone's childhood! Combine the whipping cream, sugar and vanilla in a large bowl. Beat until light and fluffy. On a large serving platter, swirl a couple of tablespoons of whipped cream onto the plate. This will hold the bottom cookies in place. Repeat for another 10-11 layers. Finish with whipped cream on top, then sprinkle with leftover broken cookies. There are always broken cookies. Recipe nutritional values will vary depending on the biscuits you use. Lemon juice to her whipped cream. She made it in a log shape and we loved it. I put creme de menthe liqour in to the whip creme.. delish! My Aunt Pauline always made this when we would visit her. 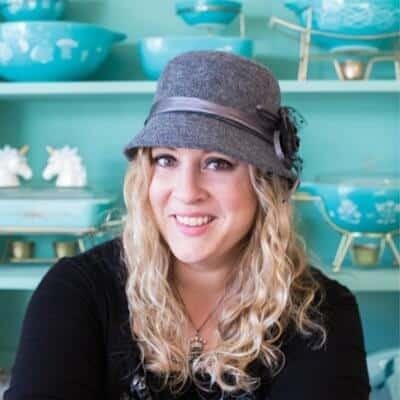 She was not the “from scratch” baker than my Mom was. Always loved this and occasionally make it. Always loved it! I can find the wafers at most stores in my area, guess I’m lucky. Try Acme or Stop N Shop. I think I might just make this over the weekend to share with my friends who are coming over to celebrate my birthday with me. I could not celebrate last weekend (Saturday) because I had the flu. Better late than never! Enjoy everyone! I hope you find the wafers. Oh – on a separate note – I made the picked pot roast and it is wonderful. Please look up Kitchen Magpie’s recipe. It is so worth it! I froze part and defrosted portion last night for dinner over rice. Having another portion for lunch today. So yummy! I shared with my sister and she loved it so much that she requested the recipe right away. I am so excited to see this recipe. I loved it as a child. Can you tell me where to find these cookies I don’t have a safeway or the other one near me. Thanks. Can not get the wafers anymore. Try the ice cream section of your grocery store. Giod day Karlynn..just found your site! !..with this most beautious recipe..can’t wait to try..for a brbq..oit luck..however..wondering!!? ?.how nany servings would you say….!? ?